This is it! Week #6! It has been a blast. Thank you Linda at Callingithome for opening up this fun six weeks of chaos and crafts to all of us. I thank you and my office thanks you. 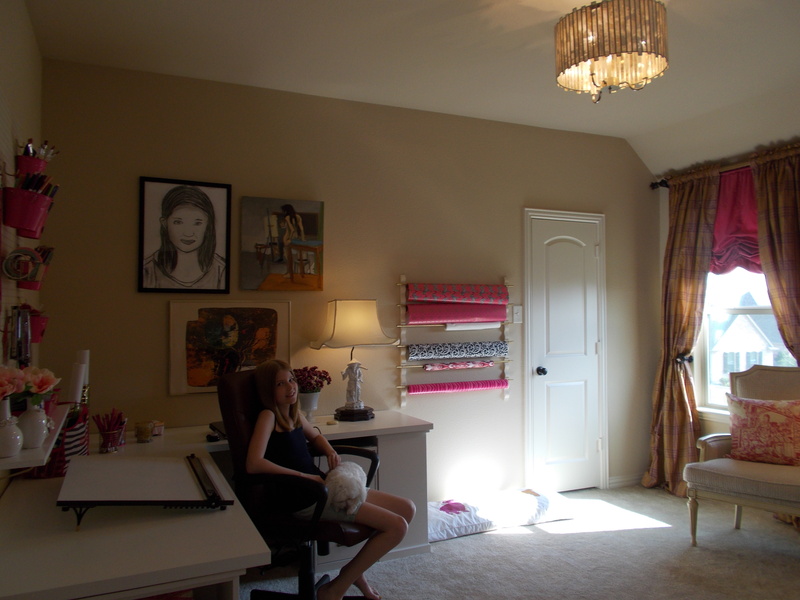 I now have a well-lit, functional, girly, and organized space to spend the better part of my days! If you’d like to see the progress on my office so far, see Week 1, Week 2, Week 3, Week 4 and Week 5. You can also see the other linking participants here and the Wednesday participants here. I’m going to keep the text short and sweet this week and let the pictures tell the story. The first picture is an overview of the entire office, which I neglected to take earlier in the day, so it’s a bit dark. My sweet daughter, Tabitha, who pointed out my mistake, is in the picture with (also sweet) Delilah. Behind Tabitha is a charcoal drawing self-portrait she did in school this year, along with my Le Ba Dang and another thrift store art find. Overview of Office with Tabitha. Desk area with art above. In the two above pictures of the desk you’ll see my two sewing machines in the bookcases below with their new toile covers. It’s thanks to the ORC that I have two sewing machines. I first participated as a linking participant last Spring when we had just moved into our house a month before. I needed to sew the window treatments for my Master Bedroom, but couldn’t find my sewing machine. I felt like I had looked in every still-packed box or bin and still I couldn’t find it, so I finally broke down and bought a new machine. Pretty soon after that, my old sewing machine appeared! 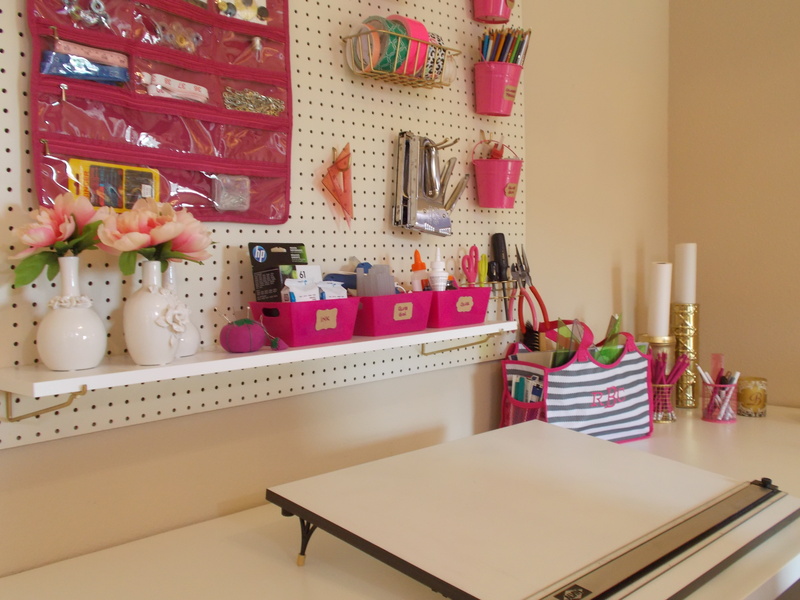 Pegboard over desk’s drafting area. The pegboard isn’t making me nauseous now that it’s decorated. I love the monogrammed tote that I got at my neighbor’s 31 Bag party. It holds all of my drafting supplies–triangles, templates, pencils, velum, etc. I changed out the drawer hardware on a Target file cabinet for a custom look. 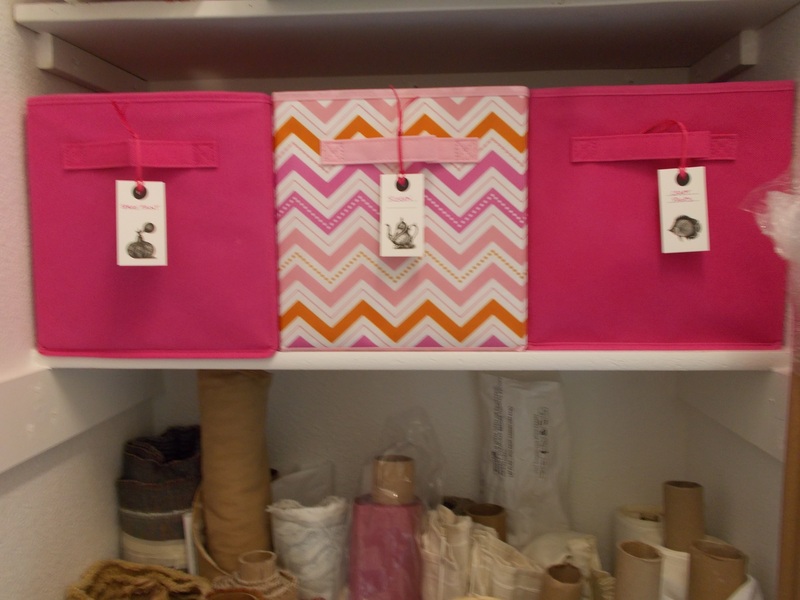 New dog beds and wrapping paper organizer. 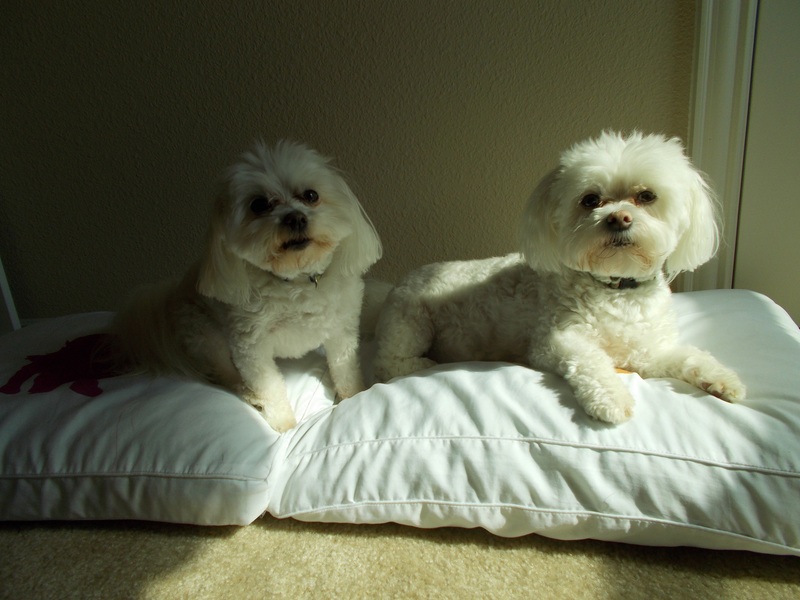 Samson & Delilah on their new beds! 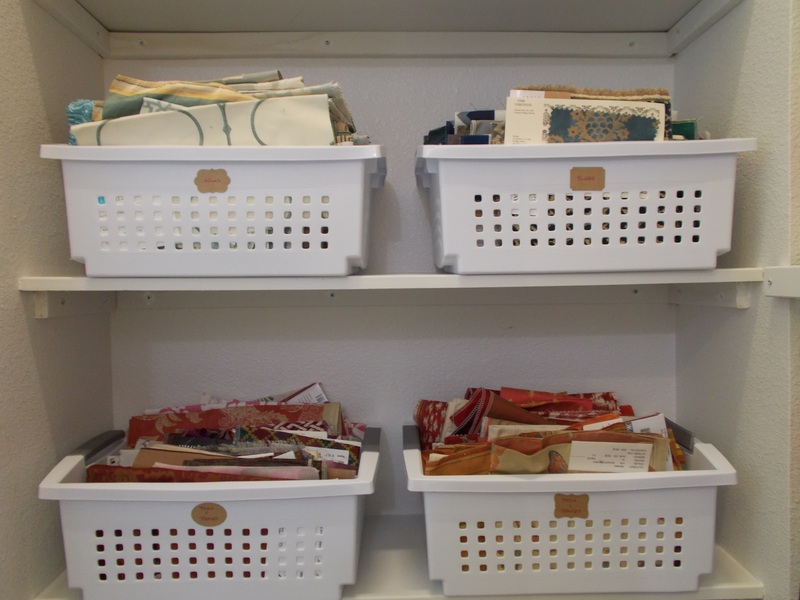 Organized closet with fabric samples. Seating area with my grandmother’s batik. Bookshelf and view into Bathroom sink area. 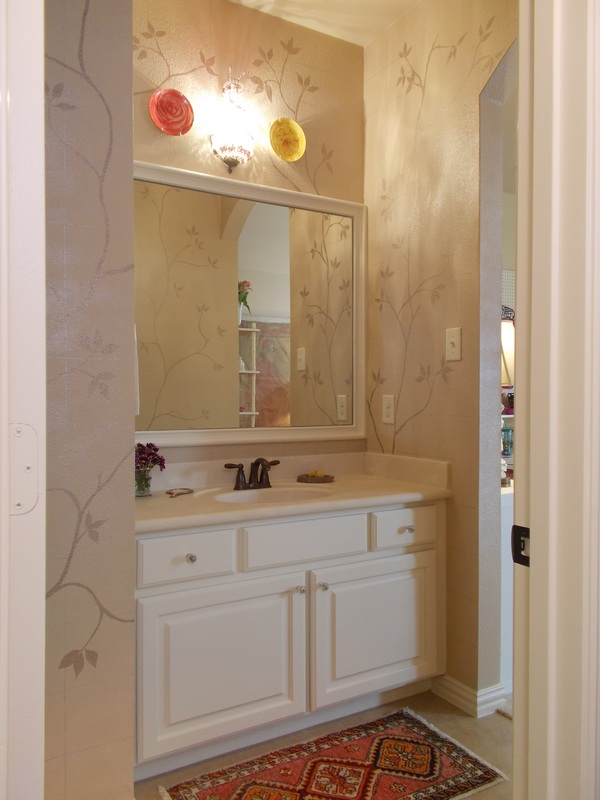 I decided to add the leafy trees on the Bathroom walls, much like the Barbara Barry wallpaper for Kravet that inspired me. 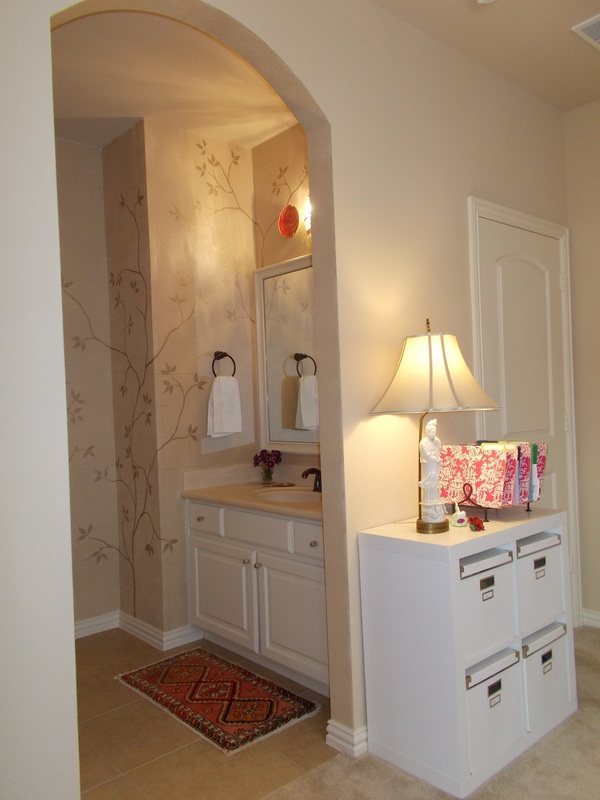 Another view of the Bathroom Area. I think that concludes our tour of my new Office. If you made it through the many pictures, thank you. I’m going to love working in this space. I’ve given myself beautiful things to inspire me (the hand-painted bathroom walls,) funny things to make me chuckle (Samson & Delilah’s beds,) and sentimental things (the self-portrait of Tabitha and my grandmother’s batik.) I can’t help but be inspired and motivated to create in this space! 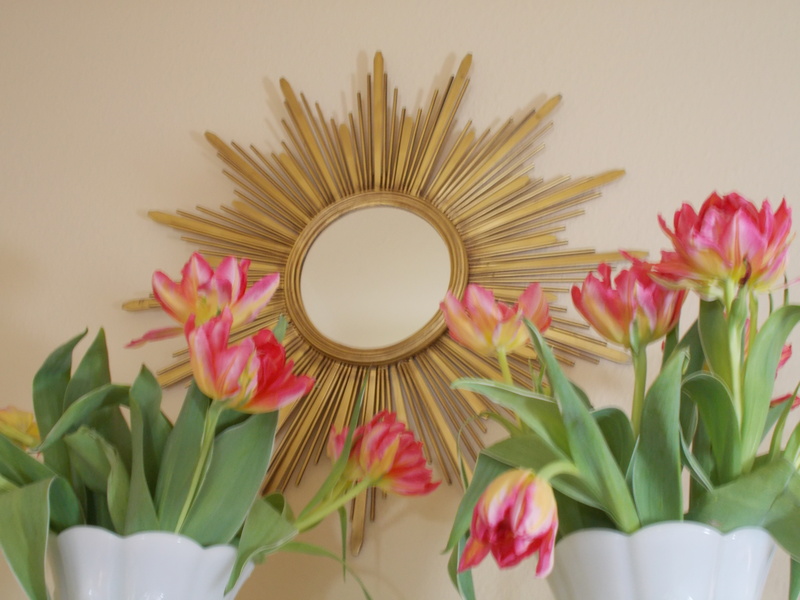 I hope you all are also motivated and inspired by your homes. If not, I highly recommend a six-week stint with the ORC! What a gorgeous office!!! 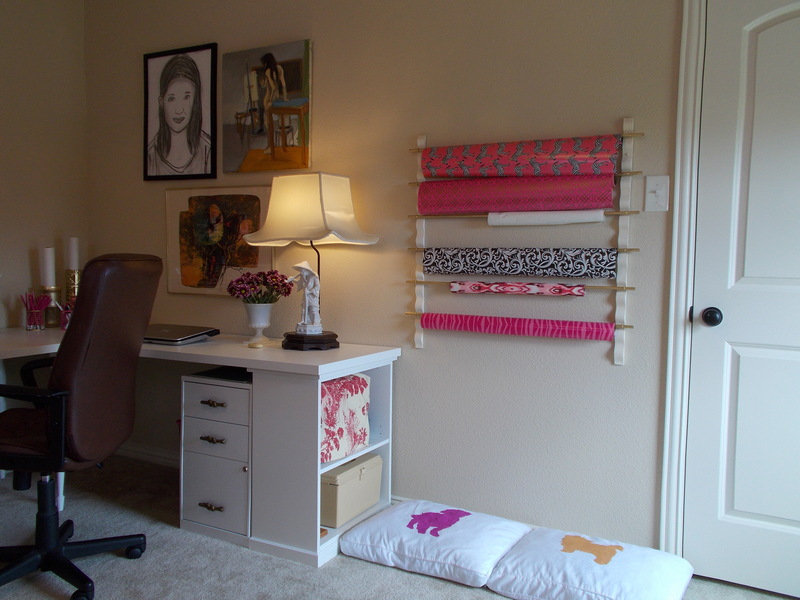 I LOVE the pink and all of the details… how fabulous are the pulls on your filing cabinets? Brilliant idea! And your bathroom looks pretty fabulous too! Congratulations on an amazing job!!! This is such a fabulous space. The storage, the bathroom and all your gorgeous accessories and fabrics. Love your color choices too. Now I would just live in the room for sure. LOVE the wall stencil! 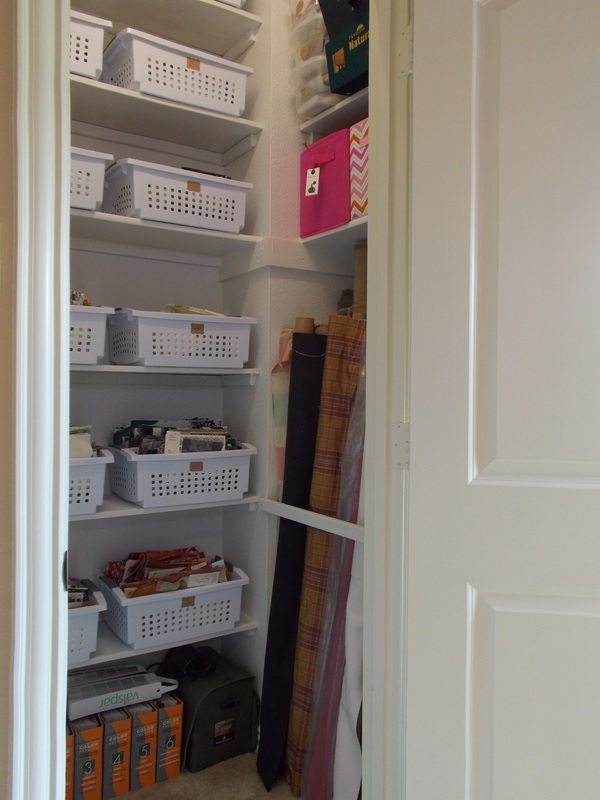 So fresh and organized…well done!! 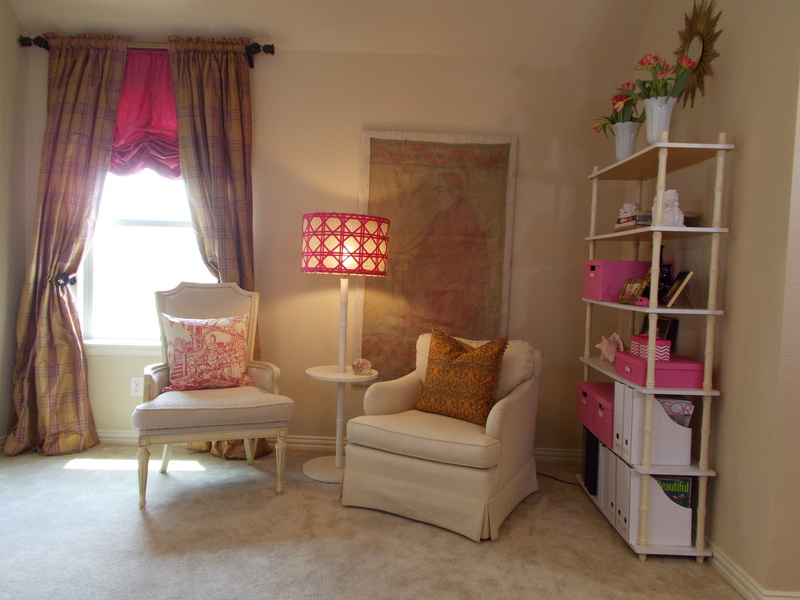 Love all the pops of pink & the way you were able to add so much storage! Your office turned out great! All that storage is amazing! I wish I had that much storage in my office! 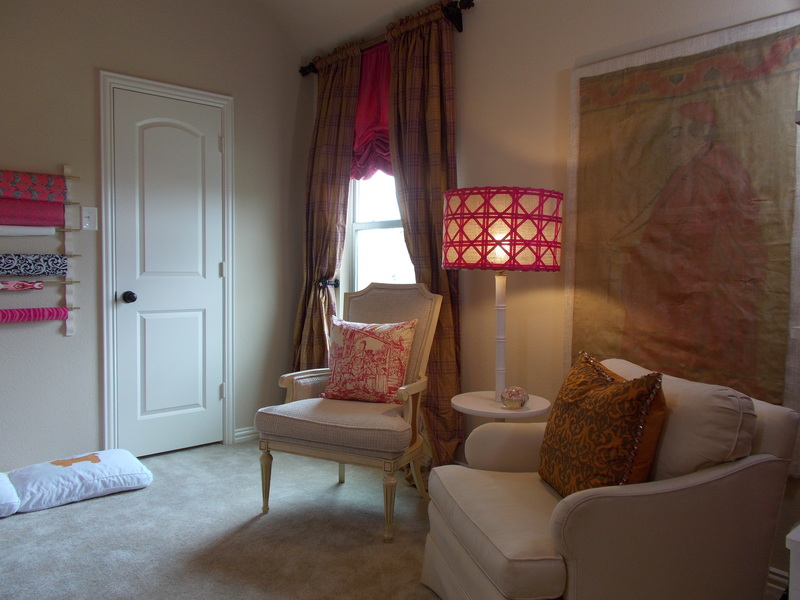 I love all the pink accents splashed about the room too! Y’all enjoy this beautiful space! 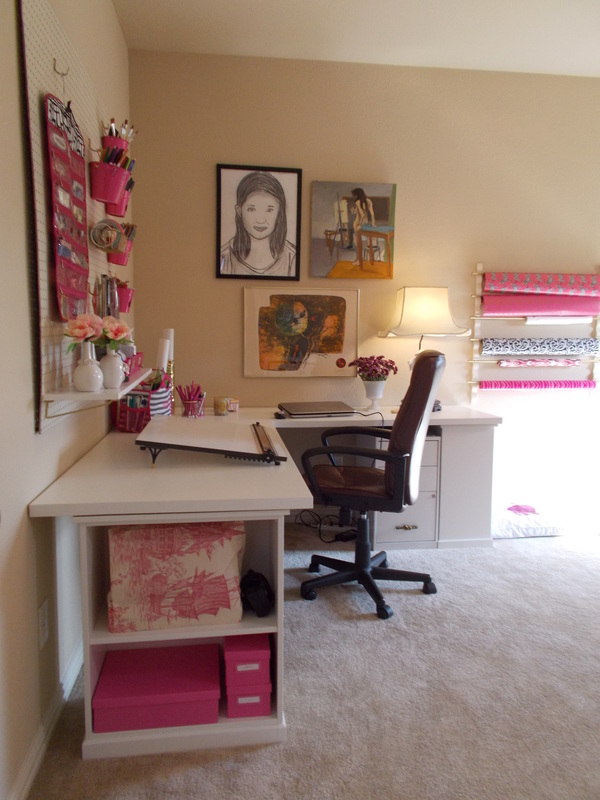 Beautiful office space! You did a wonderful job! Beautiful, so romantic and feminine. And your dogs are gorgeous! I love the room! 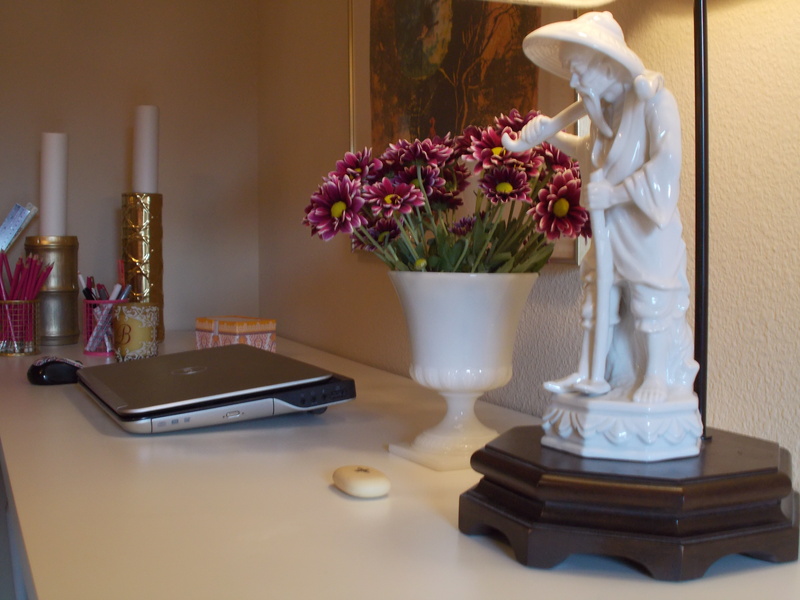 Where did you get the pink and white chinoiserie toile file folders? That looks like a space that you’ll love working in. Love those rope handles; a small change can make such a difference! What a great space! Wonderful colors. 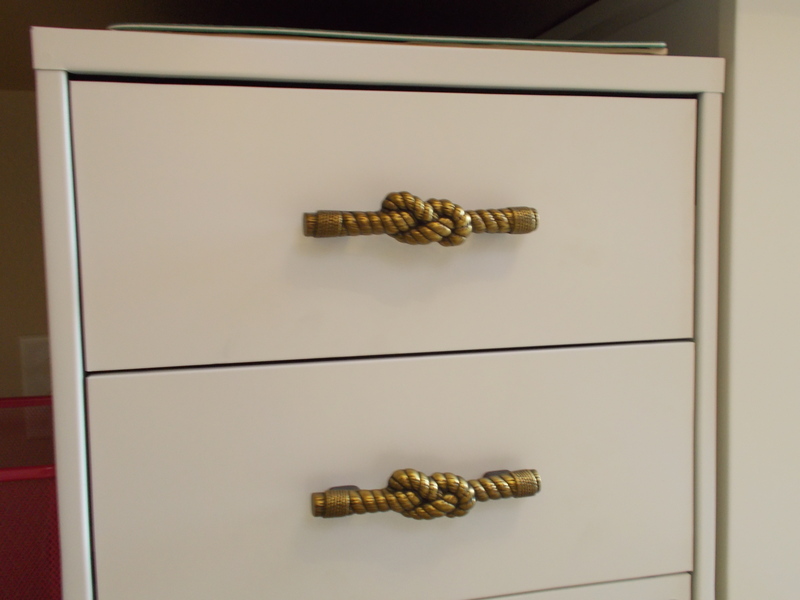 And I love those drawer pulls…wish I had some! Very nice! Your design gave me many ideas for my home office! Rachel, you and your office did a wonderful job. I love how organized this is. The pops of pink would make me smile every day. Beautiful. See you in October? 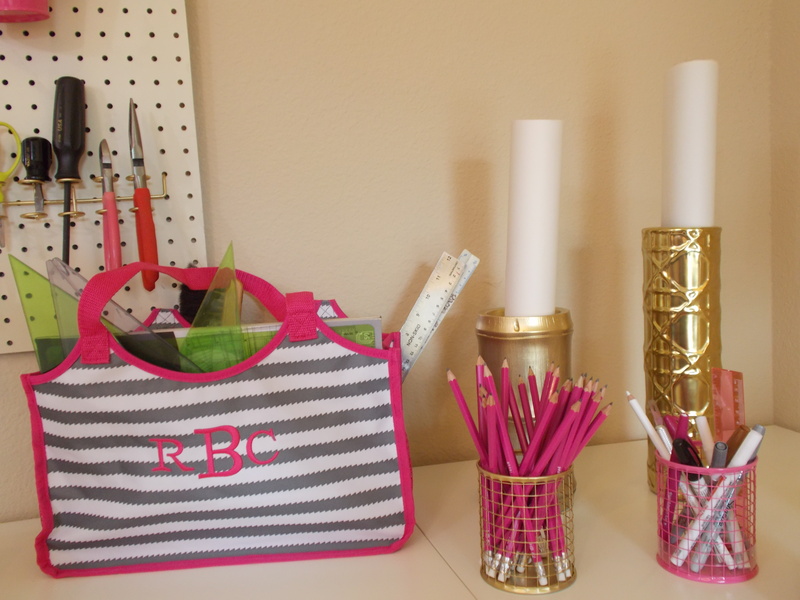 Love all the pink touches and how you organized your space! Great job! So nice and clean! Can you come do my office/craft room next? 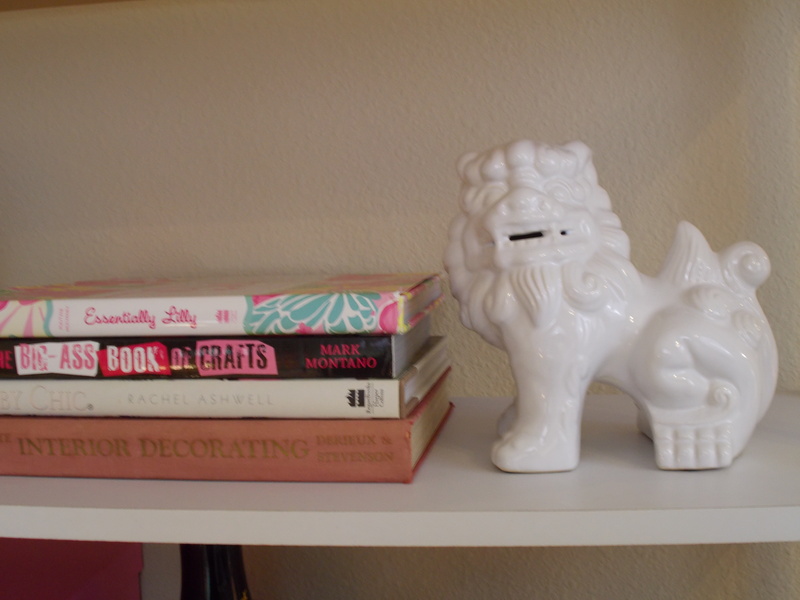 Ahhh, to have a work space this organized…. fabulous! 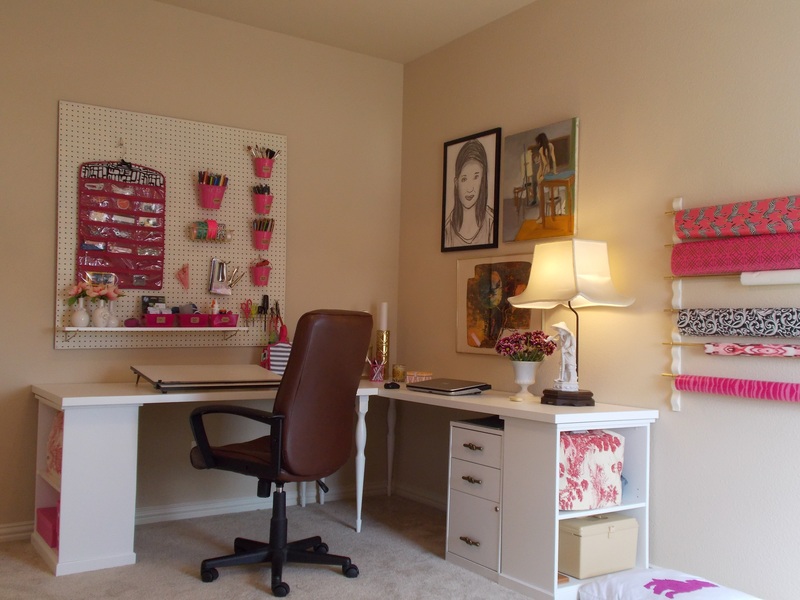 What a beautiful work space! You did an outstanding job! I love it!